I am a huge advocate for getting kids outdoors. With warmer weather now upon us, many of our kids are home for the summer. Too many pre-teens and teenagers find themselves inside on a beautiful day, either on the Internet or playing video games — many which include firearms. I’ve listed some ideas that can help get your kids off the Internet and out to the range, while learning how to be safe and responsible with real firearms. One of the reasons I joined my sportsmen’s club initially was because it listed a “Junior Rifle Club” on the website. I thought it would be the perfect way to get my daughters introduced to shooting. I was so disappointed to find out after I joined that the club was not running any longer: No leaders, no kids, no club. Fast-forward several monthly meetings and multiple inquiries later and I found a member who had his NRA Rifle Instructor Certification and who was willing to help me to start a junior rifle club. Between the 2 of us, we recruited a small team of knowledgeable and qualified volunteers. As it turned out, a few other members of my club had children they wanted involved. 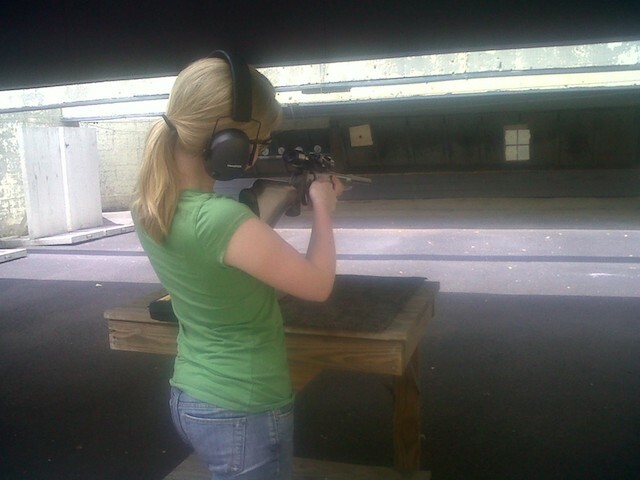 We opened up membership to youth between the ages of 12 and 18, who had an NRA Junior Membership. Parents did not need to be members of our club; we were ready, willing and able to teach anyone interested (with parental permission of course), and to top things off, we made it free. We required that parents who did not belong to the club attend a mandatory safety lesson. We wanted them to know what we would be teaching and why. This also helped a few of our more nervous parents gain trust in our program. Sometimes when you see a need that is not being met, you have to roll up your sleeves, jump on in and figure out a way to make it happen. The junior club had been stagnant for years, yet seemingly we had several members interested in getting their kids involved and plenty of well-qualified, competent volunteers. If you’re not a member of a shooting club or don’t have access to a junior shooting club in your area, don’t despair. There are plenty of ways you can get your kids to the range with you. You know your kids best; depending on their ages and maturity level you might want to start with an airgun. If you’re into the classics, every kid should have his or her own Red Ryder BB gun, Daisy BB gun or Crosman air rifle. Readily available across the country, bb guns and pellet guns can help you teach your children firearms safety. Why? Because we always treat these types of firearms as real firearms. 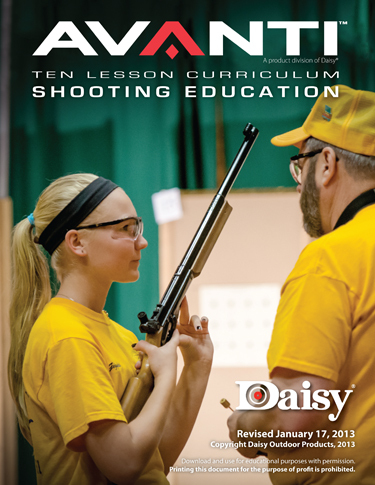 In fact, Daisy even offers a ‘Ten Lesson Curriculum” in shooting education, free of charge. Anytime you’re working with kids, you have to keep it fun. If you want them on the range with you, there are a variety of ways to keep things fresh, fun and interesting, as fellow writer Mia Anstine listed earlier in her column. Reactive targets are a great way to make things fun. Hit a paper plate at 10 feet. Reward: Gold star. Hit a paper plate at 20 feet. Reward: Gold star and ice cream cone. Keep the progression simple and get your kids excited about progressing with their shooting. The cost of an ice cream cone is well worth spending quality time with your kids outdoors on the range. Find a fun stamp to stamp a child’s “passport” with when goals are achieved. I’m a big fan of the NRA Winchester Marksmanship Program. The program is self-guided and makes for a great way to work with your kids in a structured, fun program. Working individually, you and your kids can work your way up the various rankings. Rockers, patches, certificates and pins can all be ordered through the NRA Program Materials Center. Once your child has earned a ranking, it’s easy to get the accompanying swag. The program works on a step-by-step basis — with increasing difficulty as you progress. There are marksmanship programs for air gun rifles, air gun pistols, pistols, rifles and shotguns; everyone in the family can gain competency while having fun together on the range. 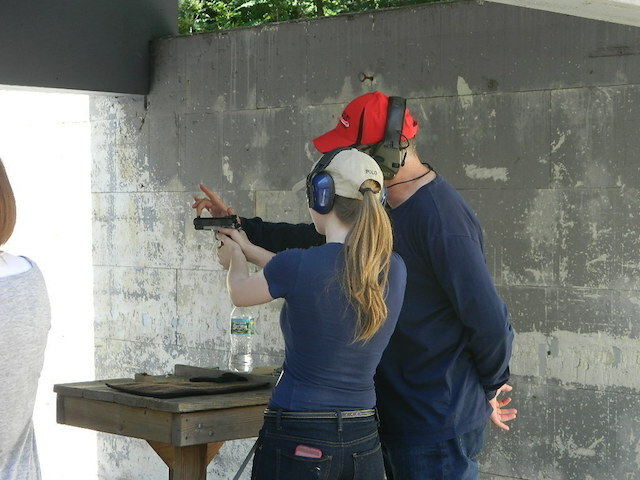 Teaching our youth to safely and responsibly handle firearms should be a must for preparing for adulthood. If you’re not a certified instructor, or just don’t want to be the one teaching your kids to shoot, there are some great organizations out there that can help! Boy Scouts of America – (Boys only) BSA has been teaching outdoor skills, including shooting sports, since its incorporation in February 1910. “Frequently Asked Questions” about its shooting program can be found here. 4-H – (Boys and girls) 4-H also has a wonderful program for kids. Included is a great shooting program. Click here for more information and to find a chapter near you. Scholastic Shooting Sports Foundation – Interested in clays? SSSF has you covered and is a leader in youth development shooting sports programs. While these are just a few examples, there are many resources available for youth interested in shooting sports. A great general resource is the National Shooting Sports Foundation. Information on many of the available youth programs can be found on its site. Our children are our future, and if we don’t make the time to get them involved in the things that matter, no one will. It is our responsibility as parents to help them gain the skills necessary to be well-rounded adults. There are plenty of ways today’s kids can be led astray and get themselves into trouble. Giving them a great foundation and education in shooting sports a great way to teach many important life skills. Let’s get our kids off the Internet and outdoors on shooting ranges.The lifelong skills they learn now, will serve them well into the future. I don’t see mentioned here the Civilian Marksmanship Program. Their Rimfire Sporter matches provide opportunities for both older children and adults to compete and have fun. Many 4-H groups have CMP-affiliated programs, as do some clubs. They also provide air gun competitions in which kids excel and even have scholarship opportunities. Thank you for mentioning CMP, it’s an excellent program for kids and adults!